The one bedroom property is entirely independent of the rest of this finca ensuring total peace and privacy for guests and is located in Guatiza, just five minutes drive from the popular yet unspoiled beach at Arrieta and five minutes’ walk from Cesar Manrique´s world famous cactus garden. 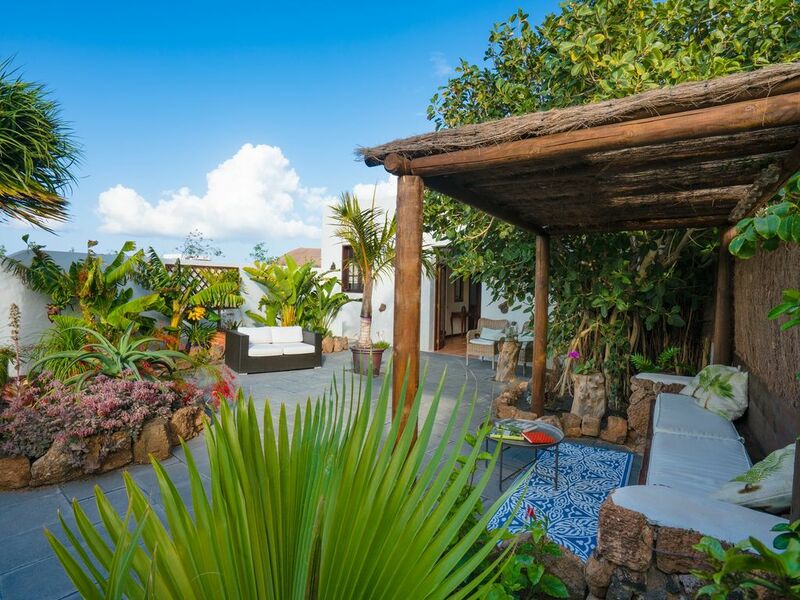 Finca Botanico boasts a beautiful private courtyard garden which is packed with mature tropical plants, and divided into different chill out areas with comfortable seating and an outdoor shower. Enabling guests to relax in style and enjoy a real feeling of outdoor living and a connection with the stunning surrounding countryside. The bathroom is brand new, marble tiled and boasts a good quality power shower as well as plenty of natural light. We provide guests with bath towels as well as towels for use outdoors or at the beach. The village of Guatiza retains an authentic rural and unspoiled character and Finca Botanico is surrounded by fields where local farmers cultivate a variety of produce. A supermarket, cash point, bars and restaurants are all within a few minutes’ walk of the property, with wonderful scenery and plenty of delightful country walks right on the doorstep. We've lived on Lanzarote for 15 years and have a passion for gardens, which the wonderful climate here allows us to enjoy all year round. We bought the finca last year, as it's in a great location, is over 300 years old and has lots of character, as well as great garden spaces. The Finca is in a quiet location on the edge of Guatiza where there are some quiet bars, and a restaurant and a supermarket. We spent a week in January walking on Lanzarote and looking at the flowers and birds. Finca Botanica is a good base for this kind of holiday, and very comfortable and relaxing. The interior is very tasteful and practical, and had everything that we needed. The instructions to find the Finca were very clear, and we had no problems finding it, and we were welcomed by Gaby on arrival. We really enjoyed our stay here. The house was exactly as described, very well equipped and comfortable. The attention to details was much appreciated. The owner was very helpful throughout the process and answered all questions promptly and informatively. Beautiful location, unless you are looking for parties! We look forward to returning! Glad you enjoyed your stay Martin, we look forward to welcoming you again in the future. The accommodation was as advertised, no disappointments. Good location to view the north of the island ,car needed. We had a lovely holiday , can recommend if you want to relax in a private space. Super nette Vermieter, tolles Haus! Alles vorhanden was man für einen entspannten Urlaub braucht. Liebevoll angelegter Garten mit romantischen Sitzmöglichkeiten. Der Strand von Arrieta (nicht überlaufen, echt schön) ist mit dem Auto in 10 Minuten zu erreichen. Wir haben uns sehr wohl gefühlt, hatte eine tolle Zeit und können das Haus nur empfehlen! Vielen Dank für Ihre Bewertung, freuen wir uns, Sie hatten eine gute Zeit.